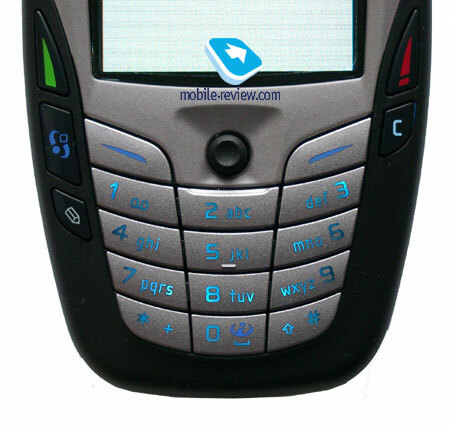 As soon as Nokia announced the new model, the 6600, fans all around the world started to wait for its release. Since Nokia currently has the biggest share on the market – it can afford releasing slightly modified models from time to time and people will still buy them. 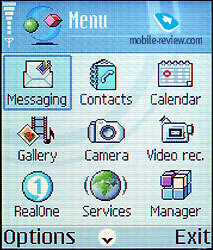 The smartphone series evolution started with the release of the Nokia 7650 which offered a new type of design in the slider and a revolutionary amount of applications and functions for the day of it’s release, amongst others MMS and a built-in camera. 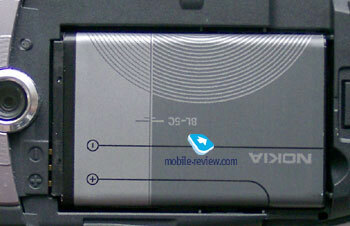 As a result, this phone became very popular, and several operators used it for deploying the first MMS advertisements. The main buyers were businessmen and people who were attracted by style and price. Next step – when releasing a phone directed towards youths, the Nokia 3650 saw the light of day at a reduced price and now with MMC support, and because of that the model was a success. 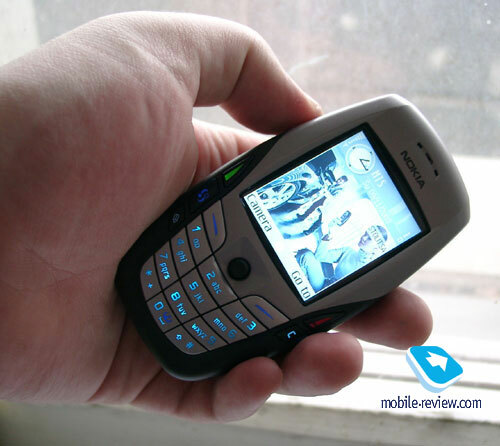 At the moment Nokia’s two earlier Symbian Series 60-models – the 7650 and the 3650 - faces a generation change. Both new models – the 6600 and the 3660 - don’t bring anything new comparing with the same Nokia 3650, in general only slight cosmetic changes. First of all display supports up to 65000 colours (TFT). I can’t answer your question whether it’s vital or not for a smartphone, but it’s definitely better than the 4096 colours used in previous models. The bad thing is that there are no major changes comparing with the previous display generation and while surfing most of the menu (white back ground, icons, text) you can’t actually see any changes. The contrast and brightness settings became wider, mostly for advanced users. After reading the last passage a lot of people will probably start blaming us for not talking about the screen's improvements. It's obvious that changing the display capability from 4096 to 65K colours it should have been improved, and as a matter of fact - it has, but it's not as good as it could be. 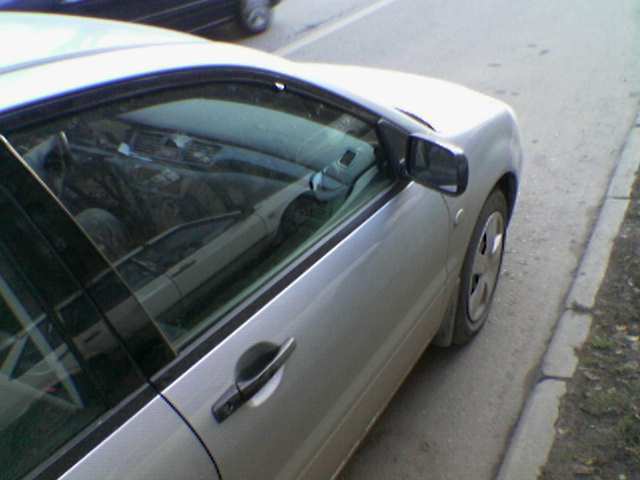 And unfortunately, no big alteration can be seen if you use the built-in camera, and that makes it even harder to see any special differences between the Nokia's 3650 and 6600 screens. The probably biggest advantage of the new display is that it doesn't fade out when facing direct sunlight. Well of course it does fade out, but not as much as it used to in the older models. The screen's resolution is 176õ208 pixels (35õ41 mm), up to 9 text lines can be displayed at once, the 9th is used for service needs. Overall the screen can be compared with the ones used in analogue models, which isn’t bad. The keypad's backlight is blue and not very bright, but it's good enough to use. Nothing out of the ordinary. The IrDA port is located on the left side of the phone, and there are no buttons for changing the volume. You can change it during a conversation with the joystick, which is not a very handy decision. On the other hand, we don't often change the volume, do we? An On/Off-button is located on top, while the handsfree-port is located on the bottom, as well as the charger port. The Nokia 6600 doesn’t have Pop-port which means that you won’t be able to sync your phone with your PC, unless you do it through IrDA or Bluetooth. You will notice a camera lens on the back, and which unlike some of its competitors doesn’t have small mirror for taking self-portraits, but this can hardly be considered as a major lack. The camera’s resolution is VGA and three different qualities or compressing are available, and a night-shot mode is available as well. No big changes comparing to other Nokia smartphones were made. Here are a few picture-samples made with the camera (1, 2, 3), which I hope will satisfy your curiousity. Small notice - when you use the night-shot mode 2-3 seconds will pass until the picture is actually taken. If you move the phone during this process a blurry picture will be the result of your actions. The camera offers usual functions and can be compared with the ones used in other products. The back cover has a vertical backlash, which is rather big. We tested some other phones from various consignments, but they all were the same. If you look at the inside of the cover you'll see a special rubber padding, which is made to exert pressure from the cover to the battery, but unfortunately it can't handle its mission. In order to prevent backlash you can put a piece of paper, but be careful - it may turn things even worse after a while. A Li-Ion 850 mAh battery is used. Nokia claims that the phone will work for about 150-200 hours in stand by mode and from 2.5 up to 4 hours during actual talk. While the phone was used in Moscow it worked for 3 days, 25 minutes were used for talking daily, plus 30 minutes for other features. It takes 1 hour and 40 minutes for the phone to recharge, which is typical for smartphones and profile of use. If you turn Bluetooth on, the phone will work only 1.5 days (even though it was actually used for about 50-60 minutes). The most interesting part is hidden behind the battery. 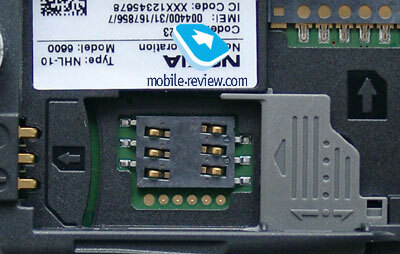 The MMC slot (phone ships with 32mb MMC card) and the SIM-card holder are located there. Nokia decided to use an exceptional type of lock in this one, and it has three positions. 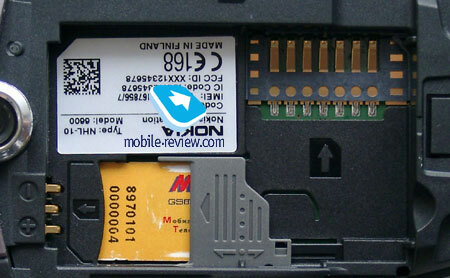 When it's in neutral position the SIM Card and MMC are fixed, and when you move them to one side or the other, you can install/remove either the SIM Card or the MMC card. The bad thing about using MMC cards, if you have multiple, is that with Nokia’s phones you have to turn off the phone first. Almost forgot to tell you about the smartphone’s dimensions (108.6 x 58.2 x 23.7 mm) which are comfortable enough, but somewhat bigger than average phones (not smartphones). It weighs 122g and you can feel the phone in your hand alright, but it would be unfair to say that it’s heavy. The Nokia 6600 comes in two colours, light grey and pink. The second colour makes the phone look like “King Penguin”, especially on billboards. Strange, but I get exactly this analogy. We will not review the camera since there have been a lot of reviews about it already. Here you can find its full description made earlier, and no changes have been made since then. Let's swiftly sum up the differences: The first difference is the increased memory size, 6 mb instead of the 4 mb used in previous models. The second is MIDP v2 for Java applications although there is no real need for MIDP 2.0 for users, at least not at this time. 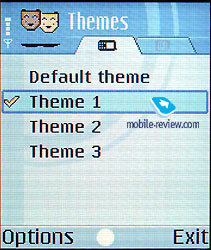 Third, from now on you can set up themes and not only backgrounds, but icons and sounds as well. Everything can be done with one or two key-pressings, which makes this feature very comfortable and easy to use. Working with applications has been improved and now you can change the language input in all applications, without having to navigate to the language set in Settings. 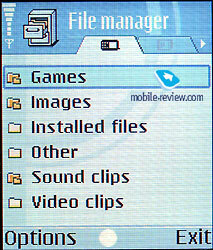 Network applications can use same setup the WAP-browser uses and you can also setup full settings for web surfing, similar to settings used in a PC. The connection will be performed through GPRS-TCP/IP. Some people claim that Opera doesn’t display web-pages correctly, which is not entirely true. The browser can display pages correctly provided the pages use a simple structure. I might add that most of the web-designers don’t care much about supporting Opera, and that’s what almost all CONCERN (?) is about. But overall, it’s alright. True Tones, one of the most advertised and anticipating features of the phone came out disappointing to say the least. It allows you to play any mp3 files as ring tone. Sound quality is awful, it can't be compared with the original mp3 file, but it's still possible to guess the melody. The function turned out to be overrated; no real changes from 7650/3650 were made. Although the mp3 player support is not mentioned on the web-site, it doesn't mean that the phone doesn't support this feature. But due to the mono headphones it's not worth the effort. Unfortunately, MMS won't work if your operator uses wap-gateway for sending them. 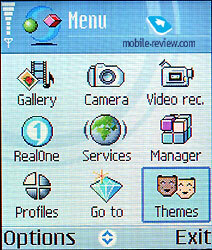 Nokia 6600 uses MMS over http technology and TCP/IP. By the way, around 50% of operators do not support MMS over http, and those who actually do, don’t charge any money for using it. 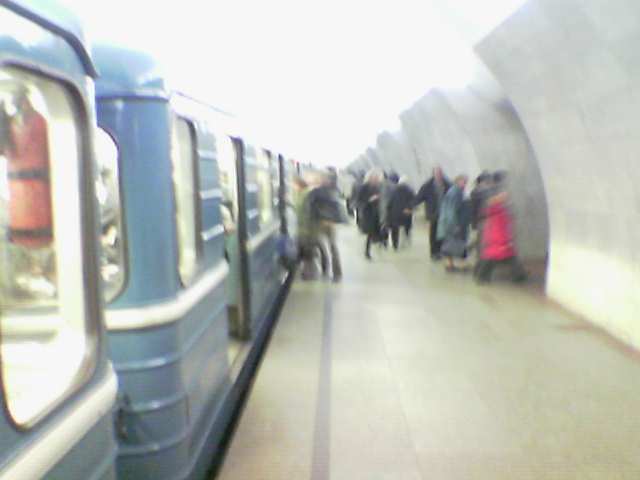 On the other hand, there were no problems encountered with sending MMS in Moscow, and most likely they are free here as well. But I still want to wait for my bill to make sure. The network quality didn't bring any bad surprises and everything works fine. The 6600 softens your voice and the ringtone volume is average however the speaker is loud, but if you set a simple melody it will be as loud as monophonic tones. The vibrating alert is average. To cut a long story short, the Nokia 6600 offers some few cosmetic changes since the release of the 7650/3650, but on the whole - it's the very same phone. A better screen isn’t solely a good enough reason for upgrading to the Nokia 6600, but this model is more made for people who are in a greater need of features than the Nokia 7650 can offer, or maybe they simply need more memory. For those of you who are buying your first smartphone and are looking for a wide extent of features - this model is not the one you should be looking for. The quality of the casing and the uncomfortable keyboard are two downgrading items to consider. By the way, some of the new bluetooth headsets don't work properly with the Nokia 6600. At the moment the smartphone doesn't have any real competition, mainly because of the features. 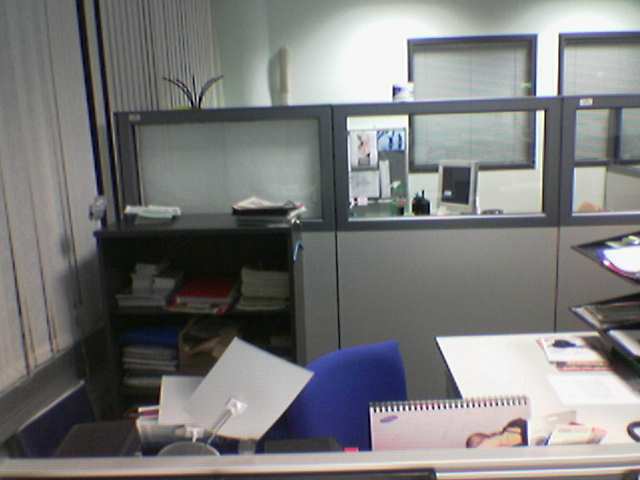 For example, the Siemens SX1 has even worse ergonomics, same functions and almost the same display. The main competitor could be the Nokia 3650, but the ergonomics isn’t good here either. We won't compare the 6600 with the SonyEricsson P900 because of one thing - the price. Furthermore, since the P900 has all the best features in its class, it doesn't have any competitors at all and can be sold at a maximum price. Probably the only phone that can be competitive with the 6600 is the new Sendo X, although it's not yet sure if Sendo will be able to release the phone before Christmas. In my opinion, Sendo X will remain the potential competitor, but will not become one. Mainly because of different positions on the market. 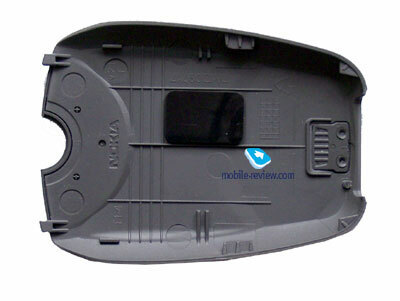 At the moment, the Nokia 6600 costs around $600, but in the beginning of the year 2004 it will cost around $450-$475. The price will continue to drop until it will reach the $350 mark. After that - a new model is sure to come out as a replacement. 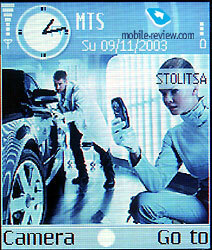 Two major factors behind the price set for the Nokia 6600 are represented by image and brand. In addition, there is no alternative to this device yet which will allow Nokia to sell a good deal of 6600's around the world. My advice is simple: If you really need a smartphone - buy the Nokia 6600, but only in case if you are limited financially. If you have enough money to spend on a good smartphone - pick the Sony Ericsson P900 (or P800). If you only need a camera, a dictaphone, a color screen or some other casual functions - buy a usual phone. Because of the progress it's possible to get one with all these functions, but in a smaller size. Ìîé ñîâåò ïðîñò. Ïðè îñîçíàííîé íåîáõîäèìîñòè â ñìàðòôîíå ñëåäóåò áðàòü Nokia 6600, íî â ñëó÷àå, åñëè åñòü îãðàíè÷åíèÿ ïî äåíüãàì. 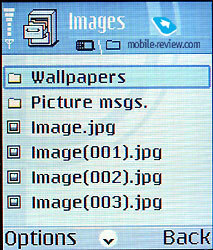 Åñëè âû íå îãðàíè÷åíû â áþäæåòå, òî âûáèðàéòå Sony Ericsson P900 (P800 êàê âàðèàíò). Åñëè âàñ ïðèâëåêàåò êàìåðà, äèêòîôîí, ýêðàí, êàêèå-òî äðóãèå ôóíêöèè, òî ïîèùèòå îáû÷íûé àïïàðàò. Áëàãî åñòü èç ÷åãî âûáðàòü, ôîðì-ôàêòîð òåëåôîíîâ òàêîé æå, íî ýðãîíîìèêà âûøå, à ðàçìåðû ìåíüøå.